These tulips, the “Artist” variety, grow next to our front door in Missouri. But then two days later he got his revenge. “We have our orioles back. Oh, you haven’t seen any?” A bit irritating indeed. I had not seen an oriole yet. UNTIL THIS MORNING! A bright orange spot in the young green leaves. Hard to miss. Of course I called right away. My garden lady thought these belonged in my garden. And so alongside the sugarwater for the hummingbirds I now have a feeder with two orange halves and some banana for the oriole. 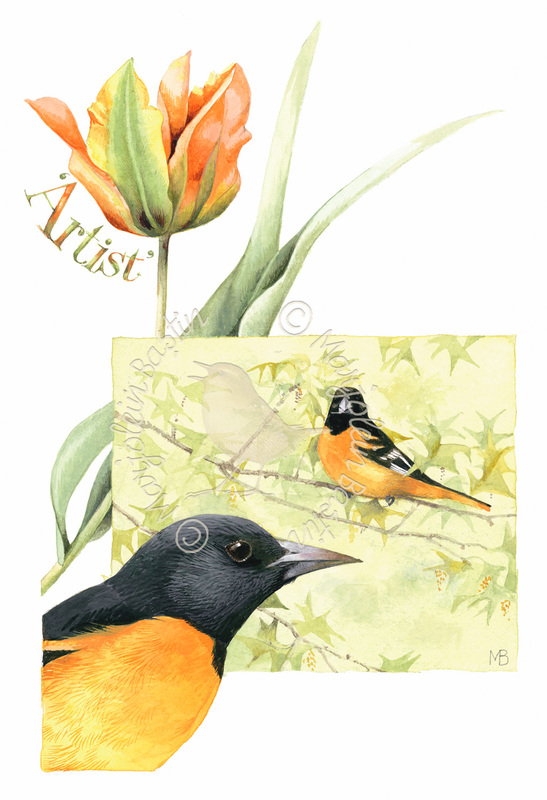 Orioles artfully weave their nests of flexible blades of tall grass or other fibers at the end of a branch. I once found a nest that had been constructed with some blue nylon thread as well! A few months ago I heard on the radio that the Baltimore oriole has now also been spotted in the Netherlands. Would be great to have this visitor at my birdfeeder in the Netherlands as well!